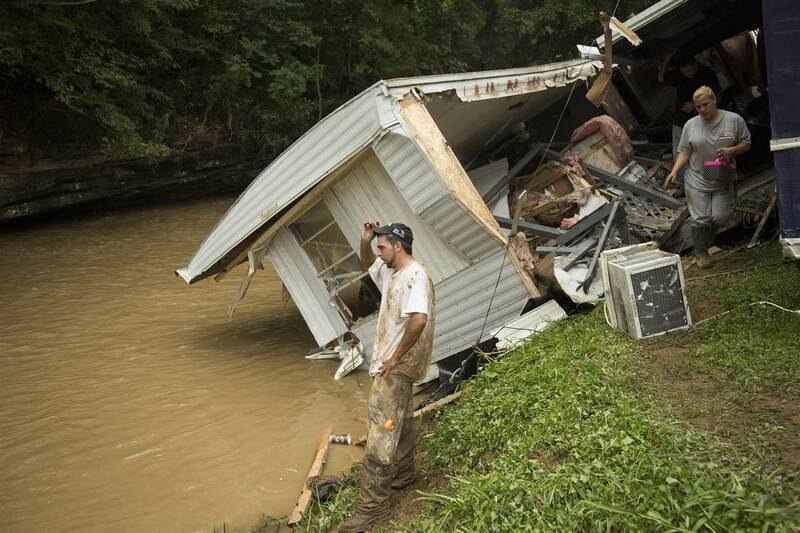 Flooding is the most frequent disaster that impacts Kentucky. Kentucky averages about 56 flooding events a year with an average yearly loss of 30.4 million dollars. Sometimes, floods develop slowly, and forecasters can anticipate where a flood will happen days or weeks before it occurs. However, flash floods can occur within minutes and without any sign of rain. Floods can happen anytime and anyplace. Being prepared can save your life and give you peace of mind. Talk to your insurance agent and make sure that you have proper coverage, particularly if you live in an area prone to flooding. Copy important documents. Keep a copy at home but store additional copies in a secure place outside the home. Take photos of your possessions and store them in a secure place with documents. Have an emergency plan that includes best contact phone numbers and an evacuation plan. Have an emergency kit that includes a flashlight, matches, batteries, candles, blankets, and a three-day supply of food and water. Monitor weather warnings in your area and heed official instructions. Never walk or drive through a flooded area. Turn around; don’t drown! Six inches of water can cause control issues and stalling. A foot of water will cause many cars to float. Stay away from downed power lines or other electrical wires. After a flood, check for structural damage before entering your home. Remove wet and damaged contents and dispose of them properly. Sanitize affected areas to prevent mold growth and contamination. Mud and water from flooding can contain chemicals and raw sewage. Perhaps you remember as I do, participating in “show and tell” as a child in elementary school. In case you’re not familiar with show and tell, it’s an informative presentation involving the demonstration of an object. While the class may not always need the demonstration of the object to understand the information presented, together, they communicate much more effectively. Jesus used show and tell as a means of sharing the gospel with those He encountered. He demonstrated the Father’s love and preached the message of salvation. He was always showing and telling, healing and preaching. The Scriptures emphasize the importance of using actions and deeds when sharing the gospel. It doesn’t say stop using words altogether when sharing the gospel. But it does say stop “just” using words. In other words, show and tell the love of God. One of God’s frustrations with His people is that we sometimes honor Him with our lips, but our hearts are often far from Him. 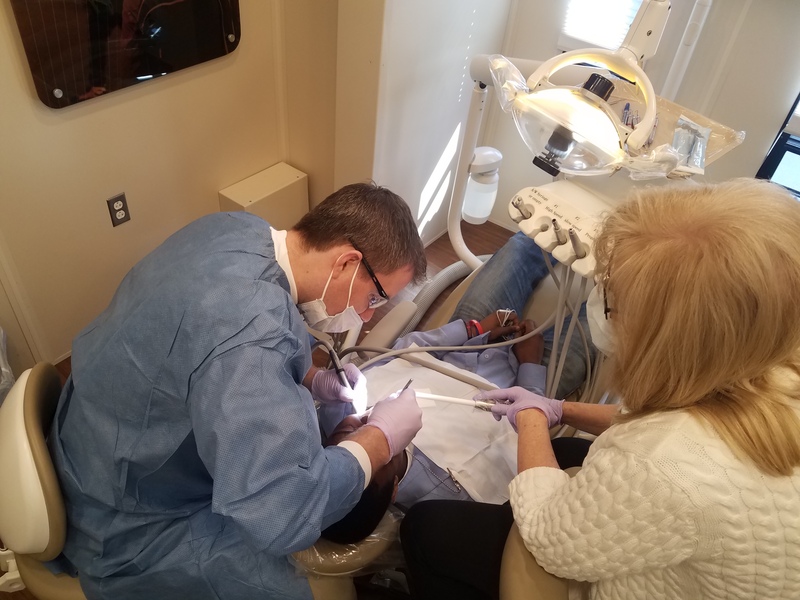 I witnessed a show and tell of the gospel in an effective way on a recent Saturday in Bowling Green when Rich Pond Baptist Church assisted Christ Fellowship Church in conducting a dental clinic. The Kentucky Baptist Convention partnered to provide training, dental supplies and use of the North American Mission Board’s mobile dental unit. Brent Fields, Minister of Missions and Outreach at Rich Pond shared that “this opportunity to meet physical needs served as a bridge for sharing the gospel”. Preparation for the clinic began months in advance with training, enlistment of professionals and canvassing of the neighborhood. On the day of the clinic, over 35 volunteers worked together to shepherd almost 100 refugees through registration and dental screening, cleaning and pulling teeth, filling cavities and ending pain. While waiting to be treated, patients heard volunteers share stories of salvation and life transformation. All day long it was a show and tell of the gospel. The churches intentionally targeted a refugee population from Africa because of their desire to develop an on-going ministry to their new to Bowling Green friends. Brent shared that he overheard one volunteer tell a patient from the Congo, “we do this because Christ loves us … and He loves you too!” Every person coming to the clinic was part of a show and tell as they were shown love in a practical way and told about the gospel of Christ. Brent also commented that “the dental clinic provided professionals an opportunity to use their skills to demonstrate the love of Christ”. Churches of any size can show and tell the gospel in their own community and a dental clinic is not the only way to do it. Other ways to show and tell include after school ministries with children, pregnancy care, small group ministry to recovering addicts or ex-offenders, food and clothing distributing, foster parenting or adoption, rent or utility assistance, parenting courses, home repair, ESL classes, tutoring, etc. There is no limit to the many ways we can show and tell about the love of Christ. We must open our mouths to fully express the gospel, but using only words doesn’t fully demonstrate His love. Live the gospel and share the gospel. Words and deeds. Lips and life. Walk and talk. Show and tell! Tim Bargo, Executive Director of First Priority Tri-County, was recognized as the 2018 Kentucky Missionary of the Year on Saturday, April 7, during the Kentucky Woman’s Missionary Union Celebration at the Buck Run Baptist Church in Frankfort. First Priority Tri-County is part of a national organization (First Priority America) whose main goal is to encourage, equip, and empower students to share their faith in Jesus on their middle and high school campuses. First Priority Tri-County serves Knox, Laurel, Whitley, Clay, and McCreary counties and has 27 student led evangelical First Priority clubs meeting weekly. In June of this year (2018), First Priority will be 10 years old and Tim has been at the helm since its inception. During that time, 1981 students have prayed to receive Christ. Since August of this school year alone, the organization has give out 1432 Bibles, witnessed 10 students praying to receive Christ, trained 210 students to be campus missionaries, brought together 25 local churches and 1109 students for a local youth rally, and organized 2411 students for the “See You at the Pole” event. Recently Tim has taken the lead to create a “Day of Prayer Over Students” for the state of Kentucky. Applying to have a proclamation signed for several years, it was finally approved in 2016 and 2017. Currently it has been filed as a bill and passed the House. Join them in praying that it passes the Senate to become law. Tim is a native of Harlan County, Kentucky and currently lives in Corbin with his wife and best friend Tammy. He has three children – Brittany, Justin and Dylan. Tim was commissioned as a North American Mission Board MSC-funded Missionary on June 23, 2009 in his role with First Priority and, in addition, has served as a North American Mission Board Chaplain with the University of the Cumberlands Football Program for 10 years. Tim is an active member of Immanuel Baptist Church in Corbin, where he has led several mission trips, led small groups, and served on a number of committees. Thank you, Tim, for your love for the Lord and your faithfulness in serving Him. CONGRATULATIONS on being chosen as the 2018 Kentucky Missionary of the Year. You are most deserving.